Heavy-duty hydraulic cylinders and pneumatic cylinders should meet your toughest challenges—ours will. Our heavy-duty, mill-type hydraulic and pneumatic cylinders stand apart from those of other hydraulic cylinder manufacturers. With attention to the highest cylinder design standards, our products deliver quality, precision and performance. From manufacture to repair and rebuild, we meet the most challenging applications. 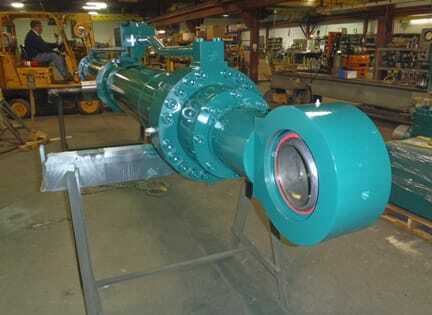 Our heavy-duty, mill-type hydraulic cylinder and pneumatic cylinder products offer a variety of features and can be customized to meet the needs of many industries. If your job requires more than standard offerings, our engineering staff will work with you to help determine what cylinder accessories you may need. Our heavy-duty mill cylinders are available in six standard mounting styles and can accommodate any practical stroke length. Cushions are optional at either end or both ends of stroke and a heavy-duty cylinder is available with two standard rod ends (but special ends can be made to order). Our cylinders define heavy-duty performance.